In three separate encyclical letters Pius XII commented on the life, identity and glory of the Unborn Christ Child. He did not use the term “Unborn Christ Child” or “Unborn Jesus” as we typically do in this blog, nonetheless, he was speaking about Christ during the nine month period from His conception in the womb of Mary up until His nativity. Today we will quote from Pope Pius’ June 1943 encyclical letter: Mystici Corporis (On the Mystical Body of Christ): #’s 30, 31, 48, 56, 75* (previously quoted on this blog several times), 98, 110. #56: If we examine closely this divine principle of life and power given by Christ, insofar as it constitutes the very source of every gift and created grace, we easily perceive that it is nothing else than the Holy spirit, the Paraclete, who proceeds from the Father and the Son, and who is called in a special way, the “Spirit of Christ” or the “Spirit of the Son.” For it was by this Breath of grace and truth that the Son of God anointed His soul in the immaculate womb of the Blessed Virgin; this Spirit delights to dwell in the beloved soul of our Redeemer as in His most cherished shrine. #75: But the knowledge and love of our Divine Redeemer, of which we were the object from the first moment of His Incarnation, exceed all that the human intellect can hope to grasp. 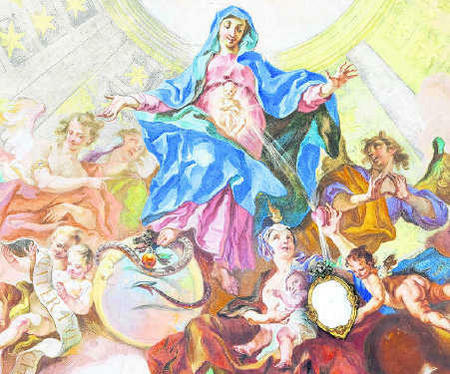 For hardly was He conceived in the womb of the Mother of God, when He began to enjoy the Beatific Vision, and in that vision all the members of His Mystical Body were continually and unceasingly present to Him, and He embraced them with His redeeming love. In our next post we will consider two other papal encyclicals in which saintly Pope expounds on Christ time in the womb.